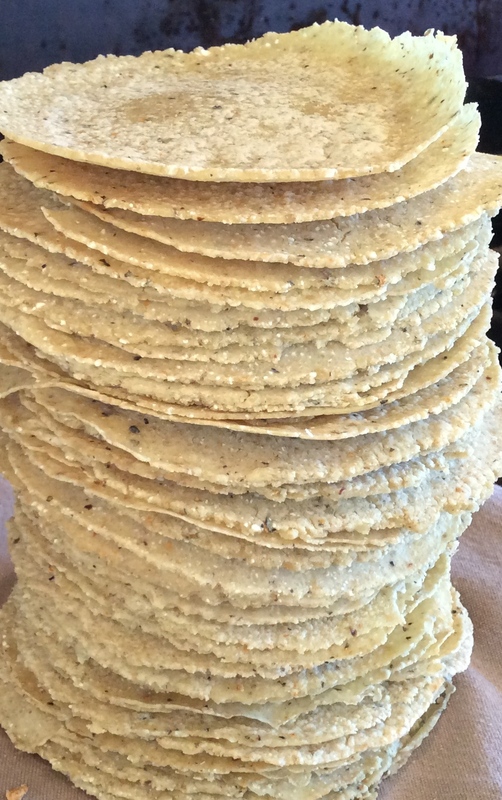 One of the great things you can do with field corn is make tortillas. Here’s how we do it. 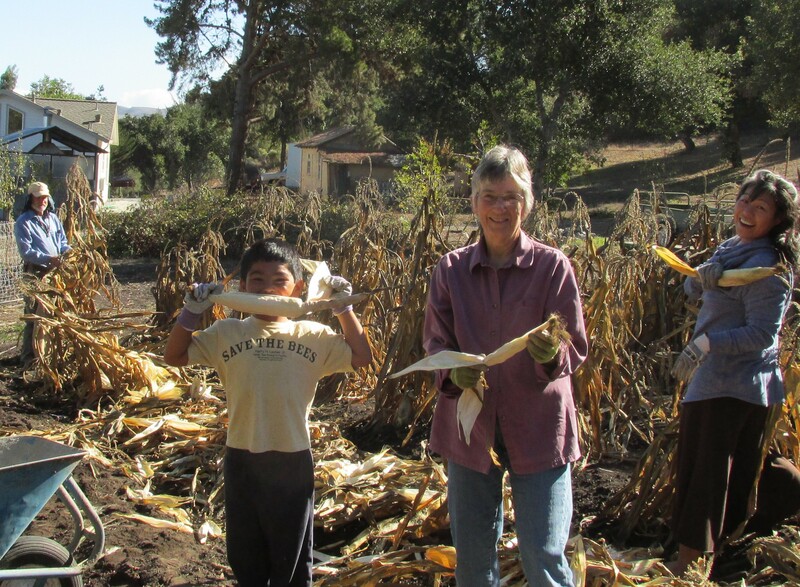 We’ve been growing Hopi White corn, which is a flour type, but dent and flint corns can also be used for tortillas*. 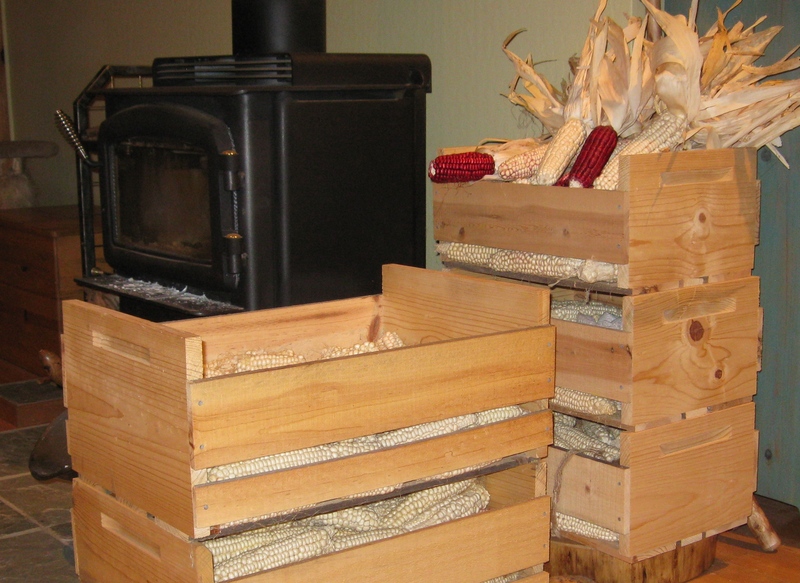 Dehusked corn drying by the woodstove. After shelling, pick through the kernels to remove any pieces of cob and other funky bits. Measure out about 2 quarts of the kernels, then rinse them off in a colander. Next, dissolve three tablespoons of slaked lime (calcium hydroxide, or “cal” in the Mexican markets) in about a gallon of water, then touch a bit to your tongue. It should give you a very mild “zap.” If it doesn’t, add more cal until you get the zap. Add the rinsed corn to the lime/water mixture. Heat to boiling, then cover and turn down to a simmer. Simmer for 15 minutes or so**, then turn off heat and leave overnight. The corn/water/lime mixture the morning after boiling. The next day, dump the mixture into a colander in the sink. Rinse the corn under running water, rubbing it with your hands to remove the remaining bits of hull. If water is scarce, do the rinse process several times in a pot instead of under running water. 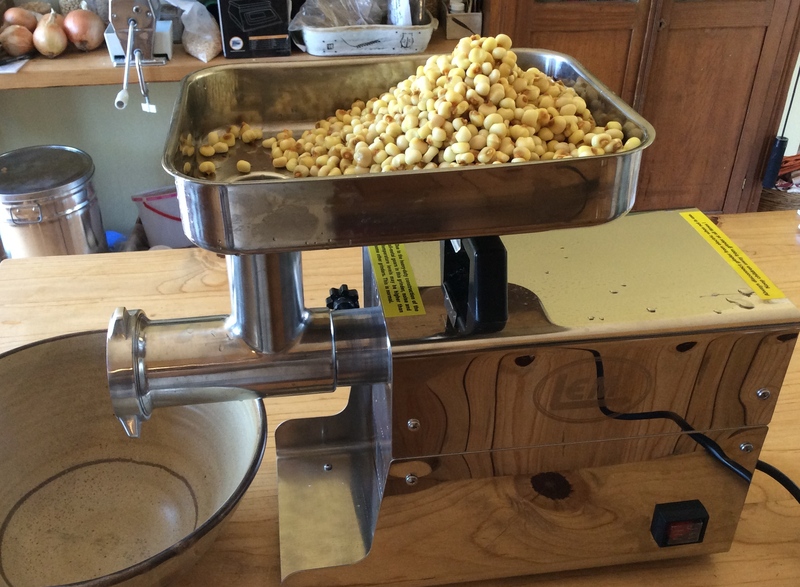 Continue rinsing until the liquid is fairly clear and there is no longer a slimy feel to the kernels. The next step is optional and I never do it: you are supposed to remove the darkened tip of each and every kernel. 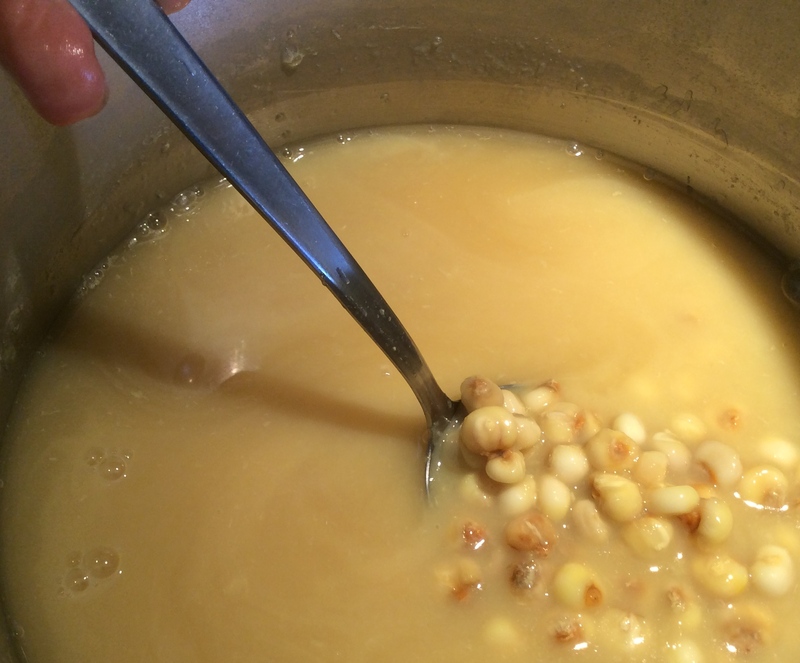 This is important for making posole, which starts with the same nixtamalization process as do tortillas: without it, the kernels won’t puff up nearly as much. However, for tortillas leaving the tips on will just result in a somewhat mottled appearance to your final product, and unless you have lots of kids around looking for a project, I don’t see any compelling reason to remove them. Next you need to grind the nixtamal into masa. This was traditionally done with a stone metate y mano, which is a painstakingly slow process. Somewhat faster is a hand grinder such as a Corona mill; putting the corn through one of these mills four times, at increasingly fine grinds, will produce a fine enough product for masa. If you are lazy like me, though, this amount of effort is large enough that it stops me from making tortillas as frequently as I’d like to, so I recently invested in an electric meat grinder for this task. More resource-intensive an option, I know, but so far no regrets. LEM meat grinder ready for work. This process still requires several passes through, using successively smaller grind plates, but is far quicker than doing it by hand. It’s easy enough that we will be having homemade tortillas far more frequently now. 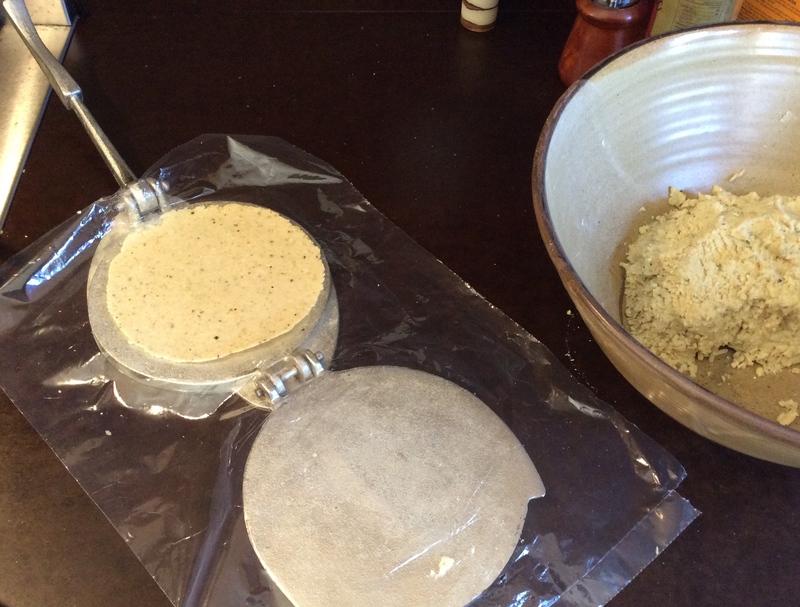 Tortilla press, with plastic bag to prevent sticking. Which is fantastic, because they’re delicious. And we have a LOT of corn that needs to be eaten. * Our choice in corn is currently based on low water use more than anything, because of California’s water scarcity. This Hopi White has been bred for dry farming, and it produces well for us without supplemental irrigation. ** Recipes vary wildly on the topic of cooking time. Some say to bring to a boil and then turn off flame, some say to boil for 30 minutes. Some say to boil for 5 minutes for tortillas, and 15 minutes for tamales. I’m not sure it matters. Lately I’ve been boiling for 15-30 min, depending on how soon I want to go to bed. 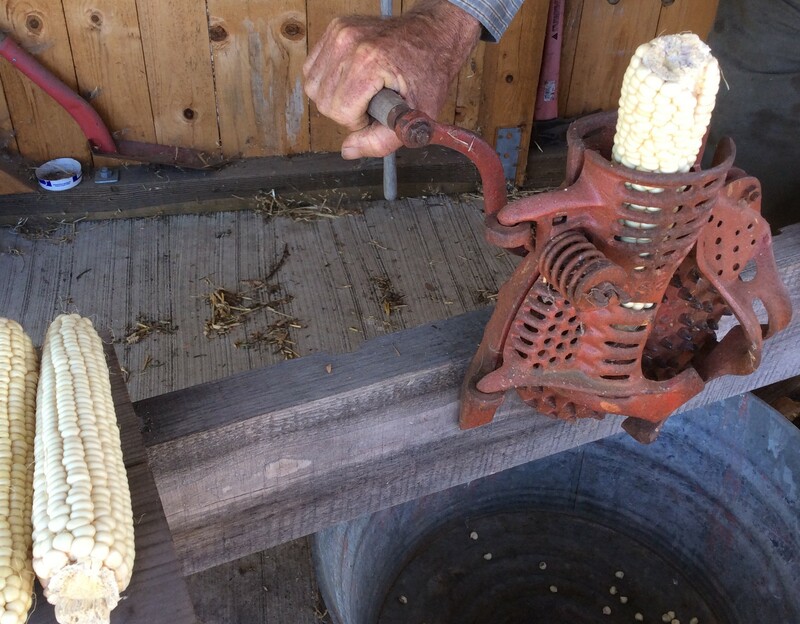 ***Nixtamalization confers multiple benefits to corn. It gives tortillas that unmistakable tortilla smell and flavor; modifies the corn biochemically so that it can make a dough that holds together; and increases the bioavailability of niacin in the corn. It has long been a component of the Mesoamerican diet; ancient civilizations, lacking a local Mexican market from which to buy pure cal, used other sources of alkalinity such as wood ash to achieve the same effect. 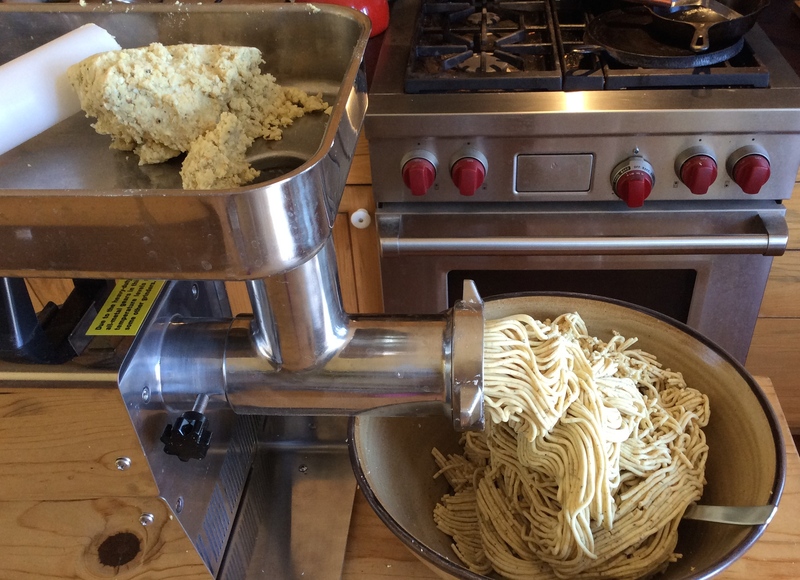 This entry was posted in grain processing, recipes, slow food. Bookmark the permalink.